Phone screen features for 8851 Cisco VOIP phone. To check which phone model you have, press Applications Applications.jpg and select Phone information. The Model number field shows your phone model. At the top of the screen is the header row. 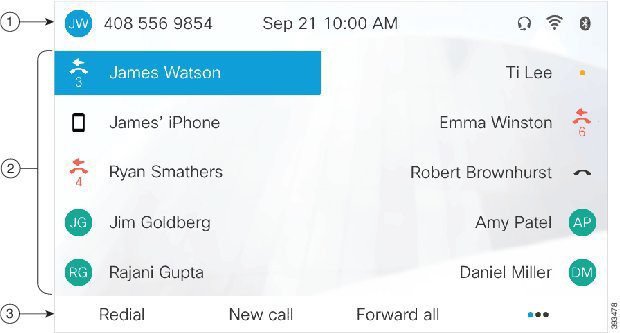 The header row displays the phone number, current date and time, as well a number of icons. The icons display when features are active. If you have missed calls, the missed call icon, and a counter showing the number of missed calls, display on your phone desktop. If you receive a voicemail, the missed call icon changes to the voicemail icon and voicemail counter until you listen to your messages. In addition, if you have more than one call on a line, either the held icon or the off hook icon change to show the number of calls.